What Is I Ching Hexagram 63 All About? Hexagram 63 represents the closing of one life chapter that leads to the opening of a new one. When a new door is open, make sure the room we are leaving is sealed closed behind us. We might be leaving a period of success or difficulty. But, it is important to make sure there are no bonds that tie us to the past. Only then, we will be able to progress without any obstacles in our new path. I Ching 63 says that if we have been successful in the last phase, we should make sure to carry this with us. You need to this to progress in the next stage. But if we are leaving behind us a difficult time, make sure to leave behind everything. Or else, that would tie us to that troublesome situation. As the flow of time progresses into a new life phase, there is a time for completion and a time to start anew. 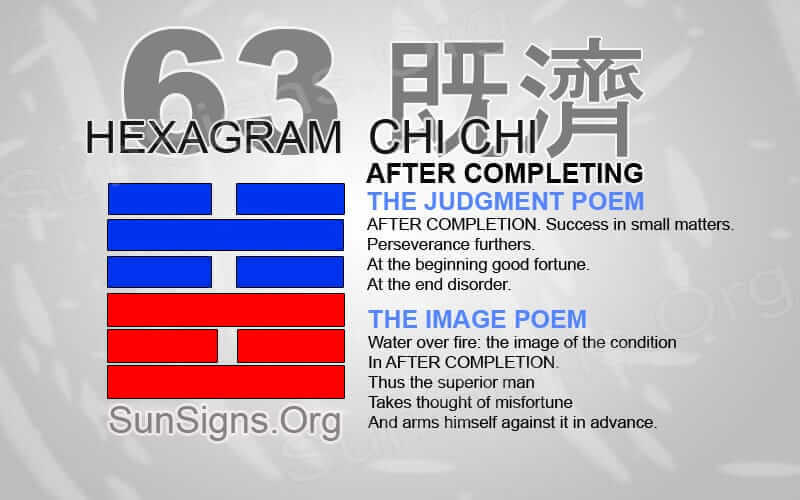 Hexagram 63 shows that when one phase has come to an end, another one will begin. Every phase in life will come to an end. Whether that is an end to a goal, a project, or just a situation in life, there will always be an end and a start to each phase. When we have completed something, we must then turn our thoughts to what can happen next. A new opportunity might present itself when we clear our plates of all tasks. It is time to start anew and step forward with a fresh perspective. Take the time to either take with you or leave behind anything that gives benefit or might hold you back. When you enter through a new doorway, make sure the door is sealed close behind you. We don’t want any unexpected difficulties from our past hindering our future progress. If we have ended a time of success, make sure to take the time to celebrate the success. Do this before continuing and making sure to take that success with you. Do not become complacent in your current state. Then it is hard to realize that the phase of life is ending and you might miss the warning signs. No matter what phase you are leaving. Make sure you become aware of what might be happening next. A new chapter in life can be fascinating. With this excitement comes the feeling dash off the starting line before the whistle has been blown. It is important to have patience with this new phase as you start to discover what is about to happen. Building up any resources and personal strength will make sure you can endure the next step in life. Have an open mind for what is about to happen next. Make sure the conscious is clear of distractions to make the right decisions. Hexagram 63 divination asks you to be sure to carry your success along with you into your next phase of business. Leave behind career decisions that did not work out and start on a fresh note. No matter what may come next, make sure to enjoy the simple things in life. Try to rid the daily life of any distractions. Ignore tasks that might take away from what is truly important in life. This new phase will bring about a sense of well being. And you will be blessed with a wave of renewal over the mind, body, and soul. It is important to preserve these feelings for as long as possible in order to continue progressing forward. Hexagram 63 shows the transition from one phase to the next and all the possibilities it can hold.